How to install a custom Operating System or modified image. Packet supports passing custom iPXE scripts during provisioning, which allows you to install a custom operating system manually, or via automated kickstart. Since we don’t test any manually installed operating system, it goes without saying that you’ll need to be familiar with our S.O.S. and rescue mode services in case you need to troubleshoot your server. Select the "Custom iPXE" operating system from the portal, or the custom_ipxe slug if using the API. If you have your iPXE script hosted at a publicly accessible http(s) location, put the URL to your script in the text field, or use the ipxe_script_url API parameter. When we serve up iPXE during the boot process we will chain-load your iPXE script URL. Should the device fail during ipxe boot, with your device set to persistently boot from iPXE you can edit your iPXE URL reboot the device to try again. Alternatively, you can pass the contents of your iPXE script directly via user-data with the #!ipxe hashbang. User data is also a feature in which you can edit should your provisioning with iPXE fail. After serving up iPXE via DHCP, the device will be marked as active in our API and portal. Since the server is sitting on the Bootloader Options and it has no ssh access, we will have to use our Console Access. If it fails during initramfs trying to load the CD device, update the install media to look for install media via the memdisk. More information can be found about this issue here. When provisioning the Custom iPXE operating system kicks off, we set the next boot option to PXE on first boot. By default, this PXE process only happens once on the first boot. 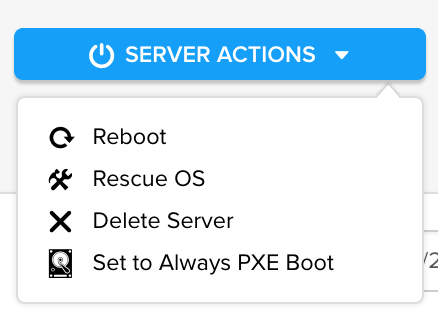 To set your device to continuously boot to iPXE first, you can edit it under 'server actions' through the customer portal. If true, PXE will persist as the first boot option past initial provisioning reboots. This is great for testing your iPXE provisioning script and lays the foundation for future, "always-pxe-based OS's" on Packet. If you would like to interact with your device via S.O.S. to perform a manual install and are not using netboot.xyz, our x86 servers require console=ttyS1,115200n8, and our aarch64 servers require console=ttyAMA0,115200. DHCP is available during a Custom iPXE device's entire life, so you can get network configured via DHCP and then setup networking statically in the OS by discovering the IP address information from our ec2-style metadata service: https://metadata.packet.net/metadata from the host. We load up our own iPXE build which chain-loads a Packet-managed /auto.ipxe script that will serve up either the chain-loaded iPXE script URL that you specify or the #!ipxe script if you've passed in your script directly via userdata. We set the variable set ipxe_cloud_config packet prior to any chain-loading or running your iPXE script. You can use this to perform Packet-specific iPXE commands if you want to maintain a unified iPXE script. Please Note: If you chain-load your own iPXE build/version, you'll likely lose the ipxe_cloud_config variable.